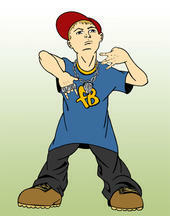 Wigger Lover: "Farrakhan's a prophet and I think you ought to listen to / what he can say to you, what you ought to do." "Farrakhan's a prophet and I think you ought to listen to / what he can say to you, what you ought to do." A few years back the rock-hop (is there a term for garbage bastardization of rock and hip hop?) Limp Bizkit would do a cover of Public Enemy's "Bring the Noise." During a section of the track where Chuck D. gives a shout out to Louis Farrakhan, Bizkit front man/Al Jolson of hip hop Fred Durst would change the lyrics to "Farrakhan's a racist that I think you shouldn't listen to." Much as Muhammad Ali once famously noted that no member of the Vietcong had ever referred to him by a common racial slur, as a way to explain his lack of enthusiasm for fighting in Southeast Asia, I must point out that no member of the Nation of Islam ever told me when I was growing up that I was going to hell, that my soul was an empty vessel, or that I would burn in a lake of fire for all eternity, just like all of my Jewish ancestors, because we had rejected God. The folks who did that were white Christians: teachers, preachers, other kids, and co-workers - all of them spiritual terrorists and religious bigots of the first order. And not one of them was selling a bean pie on the corner, or copies of The Final Call. But can we get real for a moment? What ability does Farrakhan have to do me any harm, or any Jew for that matter? When was the last time those of us who are Jewish had to worry about whether or not our Farrakhan-following employer was going to discriminate against us? Or whether our Fruit of Islam loan officer was going to turn us down for a mortgage? Or whether our Black Muslim landlord was going to screw us out of a rent deposit because of some anti-Jewish feelings, conjured up by reading the Nation's screed on Jewish involvement in the slave trade? The answer, of course, is never. If anything, members of the Nation, or black folks in general, have a much greater likelihood of being the victims of discrimination at our hands - the hands of a Jewish employer, banker or landlord, and certainly a white one, Jewish or not - than we'll ever have at theirs. White and/or Jewish bias against Nation members, either as blacks or Muslims or both, is more likely to restrict their opportunities than even the most advanced black bigotry is capable of doing to us. That's because bias alone is never sufficient to do much harm. Without some kind of institutional power to back up that bias, even the most unhinged black racism or anti-Jewish bigotry is pretty impotent. And speaking of history, for white Americans to condemn Farrakhan, while still admiring some of the people for whom we have affection - who have not only said but done far more evil things than he - is evidence of how compromised is the principle we now seek to impose on others. It is evidence of our duplicity on this subject, our utter venality as arbiters of moral indignation. It isn't that what Farrakhan has said about Jews, or gay and lesbian folks is acceptable - it isn't. But the fact that his words make him a pariah, while white folks actions don't do the same for us, is astounding. Louis Farrakhan didn't say that his adversaries should be hunted down until they no longer "remained on the face of the Earth." One of America's most revered white presidents, Thomas Jefferson, said that, in regard to American Indians. And he's on the two-dollar bill that I used to buy some coffee this morning. Perhaps when white folks begin to show as much concern for the bigoted statements and, more to the point, murderous actions of white political leaders as we show over the statements of Louis Farrakhan, then we'll deserve to be taken seriously in this thing we call the "national dialog on race." Until then, however, folks of color will continue - and rightly, understandably so - to view us as trying to dodge our personal responsibility for our share of the problem. They will view us, and with good reason, as merely using Farrakhan so that we can divert attention from institutional discrimination, institutionalized white privilege and power, and the way in which white denial maintains a lid on social change, by creating the impression that everything is fine, and whatever isn't fine is the fault of "crazy," militant black people, who follow so-called crazy and hateful religious leaders. In this way, white Americans can continue to pretend that the nation's racial problem isn't about us; that we are but passive observers of a drama concocted by others, over which only they have any control. And in this way, we guarantee the perpetuation of the very enmity we claim not to understand, the very tension we cannot comprehend, and the chasm-like divide that was created in our name and for our historic benefit, no matter how much we try and shift the blame now, heads rooted firmly in the proverbial sand. It's Segue. Segway is the motor bike thingy. "Back off genius /I don't need you to correct my broken English."